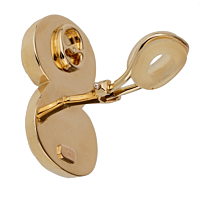 The scroll gold clip on earrings from Tiffany & Co are elegant and timeless. Featuring a double scroll S design in solid 18kt yellow gold, the earrings include a ridged detail for added visual interest. 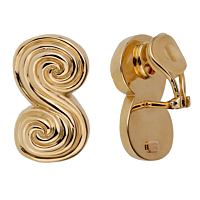 Crafted with a solid clip-on feature, the scroll gold earrings are circa 1995. The story of Tiffany & Co jewelry starts with its founders, Charles Lewis Tiffany and John B. Young, who sold stationary and fine goods in Connecticut in 1837. Today, Tiffany & Co jewelry instantly evokes a sense of pristine and classic style. Wearing Tiffany and Co jewelry can enhance any ensemble and is sure to complement any look and is available in a range of prices from our pre owned Tiffany and Co jewelry pieces or a Tiffany and Co jewelry sale items. There are plenty of bold and classic Tiffany and Co jewelry designs to choose from in an array of metals, stones and settings. Our pre owned Tiffany and Co jewelry section is full of sale items and is an affordable way to dabble in elegance.